Tu te lèves ... Allez, lève-toi! You're getting up ... Come on, get up! - subject pronouns don't appear as they would normally do. - verbs in -er lose the 's' of Le Présent in the 'tu' form. Assieds-toi ! Assieds-toi ! Sit down! These two look exactly the same to me or I can not see. Thank you Chris in advance! They are all identical to the corresponding forms in present tense. Thank you Chris. That was very helpful as always! There are also two possible pronunciations of "Assieds-toi", so one of the examples repeats it: "Assieds-toi! Assieds-toi!". The accompanying sound file demonstrates the two pronunciations. I am confused by this sample imperative sentence. Shouldn't it be Va, lève-toi! "Allez" used in this way is immutable and means "come on". Thanks! I encounter this one all the time and it's always puzzled me. Thanks also for regularly responding to people's posts. Bonsoir, The lesson indicated that when we use ‘aller’ for an imperative with a reflexive verb we should use the infinitive form of the verb as in: Allez, vous habiller! So the answer provided for the corresponding question should have been: Allez, vous embrasser! Instead, it was : Allez, embrassez-vous! Can you please explain why? Thanks! Hi "M", I don't think the "allez" has anything to do with how the imperative is formed. it is just like "Go on" in English, before the actual imperative comes. 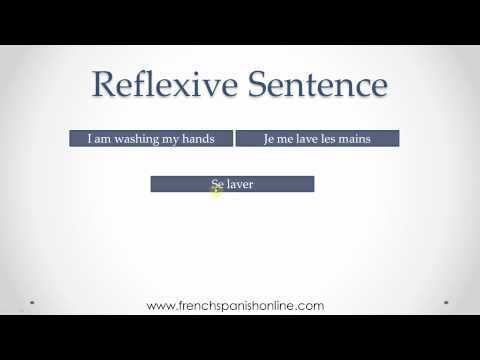 The declarative sentence: Vous vous embrassez. (You kiss each other.) The imperative: Embrassez-vous ! (Kiss each other!) The important part is that, starting from the declarative you drop the subject and invert the word order of the remaining words. Also, make sure the verb is in the imperative form and the pronound is the stress pronoun. Tu te lèves. (You get up.) Lève-toi ! (Get up!) -- Notice that the imperative of "lever" in the 2nd person singular is "lève", which is different form the ordinary 2nd person ("lèves"). And the "te" becomes "toi", which is the stressed form of "tu". Go on, wash yourself! -- Allez, lavez-vous ! Chris (not a native speaker). I am returning to your qestion because I believe I didn't completely answer it in my first try. You can say, "Allez vous embrasser!" -- Go kiss each other! It has a different connotation from "Allez, embrassez-vous!" -- Go on, kiss each other. A native speaker's input would be appreciated here, though. Allez vous embrasser! = Go and kiss each other! Allez, embrassez-vous! = Go on, have a kiss! Bonjour Loreen, The lesson says, "verbs in -er lose the 's' of Le Présent in the 'tu' form." Souvenir doesn't end in -ir, so it does not omit the s.
Pardonnez-moi, mais souvenir ne fini pas avec «-er», mais avec «-ir».